I recently completed a book design project: the life story of a colleague’s mother. [Let’s call her Miriam.] The manuscript had been in process for many months; Miriam had seen it on numerous occasions. As the book design and layout progressed, I created .pdf files as review copies for my colleague. Some of these were printed and trimmed to size for Miriam to see. And before the books were actually printed and bound, the printer sent another review copy to Miriam; this one on the exact paper stock that would be used for the final product. Finally, the day arrived when the printed and bound books were delivered and a copy was placed in Miriam’s hands. Until this point, all these review copies were merely electrons dancing on a computer monitor* or stacks of paper. But the book…ah, the book is an object that exists in the world on its own. It has weight. It has dimension. It has texture and smells of fresh paper and ink [okay, in this case, toner]. It has glue and sizing and sparkling metallic ink embossed on the cover. It makes a sound as Miriam flips the pages. And just as the transformation of written notes into a school paper makes the content seem so much more profound, coherent and well-reasoned, so too do the words of our manuscript and the photos and captions seem more substantial, of more consequence, when presented in a bound book. 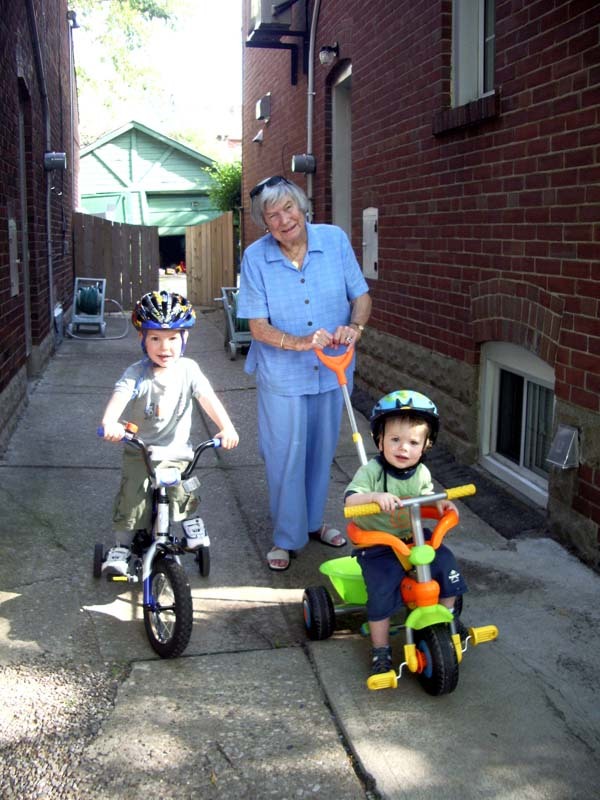 Toward the end of Miriam’s book is one of my favorite pictures: Miriam with her great-grandsons Michael and John in the driveway behind the children’s house. [The boys are about 5 and 2 1/2 at the time the picture was taken.] The caption in the book gives the children’s full names, the names of their parents and the street address of their house. And these men, with children and grandchildren and perhaps even great-grandchildren of their own, begin to share memories of their great-grandmother, and their grandparents, and their parents. Miriam’s book is passed from hand to hand. Fingers trace over the faces in the photos and discussions begin about who looks like whom. Miriam’s stories are read aloud and new stories are told by those now gathered. One of the young children, about the age of Michael when the picture was taken, spills a little gravy on the page. It’s immediately wiped off, but a trace will remain. And so this book, this lovely and compact time capsule from one century to another, will enjoy a few years of attention again. And then perhaps it will be placed back on a shelf, or boxed up in the attic, eventually given away to an antique book dealer. And someone may discover it anew, say in 2135. They will open the book and turn the pages, read the text and look at the photos. And they will get a sense of what it was like to be a woman named Miriam, living her particular life in her particular time and place. Miriam’s book has a life and a destiny of its own—far beyond any Miriam or her children or grandchildren, might have envisioned. That’s the power of the book-as-object. *I have no quarrel with e-books; I think they are a fascinating new medium through which to present information via an electronic device. But such a collection of data is no more a book than this blog or the filmography feature on a Netflix DVD. This entry was written by cj-madigan, posted on November 30, 2010 at 11:05 pm, filed under Book Thinking, Personal History, Uncategorized. Bookmark the permalink. Follow any comments here with the RSS feed for this post. Both comments and trackbacks are currently closed. . View the archives for more.